SCS Software's blog: Scania Truck Driving Simulator is now on Steam! As you may remember, Scania TDS has been Greenlit on Steam back in October of last year already. We would like to express big thanks to everyone who supported us by voting for the game! Today, the game finally becomes available on Steam. We have been so busy working on improvements for ETS2 and ATS that none of programmers managed to find the time for preparing the game for Steam distribution until now. If you already own the retail version of Scania TDS and want to have it in your Steam library, you don't need to purchase it again of course. All you need to do is to activate your retail key on Steam - read this Steam Support article to see how to do it. We are really happy that millions of Steam users will get a chance to try our game. For many of you this game is an old story by now, but we would appreciate if you could still help us - share screenshots on Steam, write a review, make videos and put them in the Steam game hub, join discussions. We are keen to see your contributions. The better the game is accepted during its re-launch in digital distribution, the more resources SCS can invest back into further development of our truck simulators. We took the opportunity to update the game with new content, too - all Scania TDS customers can download a new update to version 1.6 It includes 2 additional Dangerous Drives levels: "Power Plant Repair" and "Commercial Shooting", and 1 additional Competition level: "Bonus 4." This update is already included in the Steam version. Retail update is on the update page. It has pretty much everything that ets2 is missing. Лучше б занялись игрой Euro Truck Simulator 2 тратите время зря , и когда выйдет следующий панч ? не скоро, опубликовали два поста, абсолютна никак не относящиеся к патчу, а значит, следующая публикация, выйдет как минимум через три недели. It will be out "soon". Ah the elusive and anticipated 1.9 patch. Reminds me a lot of Michael Jacksons "This is it" tour. So close but yet so far.. oh well. Ahh sad that it is a scania..
Oh, thanks for enlightenment, expert. Now be so kind and realize that it was Scania, who was interested in close co-operation and wanted a dedicated game, while Volvo didn't mind, didn't took it seriously and even ETS2 branding was result of huge fan-based campaign. You simply cannot make a brand dedicated game (what's more, commercial game), if brand owner won't give you permission. and the same old stupid scania design belongs to MAN and vw. Well, actually it WAS the opposite, meaning Renault was from Volvo. And I say "was" because Volvo finally acquired what was remaining of Renault Trucks. They just kept the brand because of all the people that wants Renault, and to offer a "cheap" option. Currently it's just a branch of their brand, but components are same as Volvo. They were in previous trucks, and they are more now in the new Range trucks. haha, scs need our money, scania truck driving simulator is better as the community. patch bring no money! Um no? The game was green lit through steam, I see no problem with putting more games on steam, thus making it more available. Itäs not like this actually took away developing time.. It's like saying "Go to buy also this one". Will you post any news about American truck simulator? I just bought:-) Good work SCS! Oculus Rift support? Will definitely buy if there is. 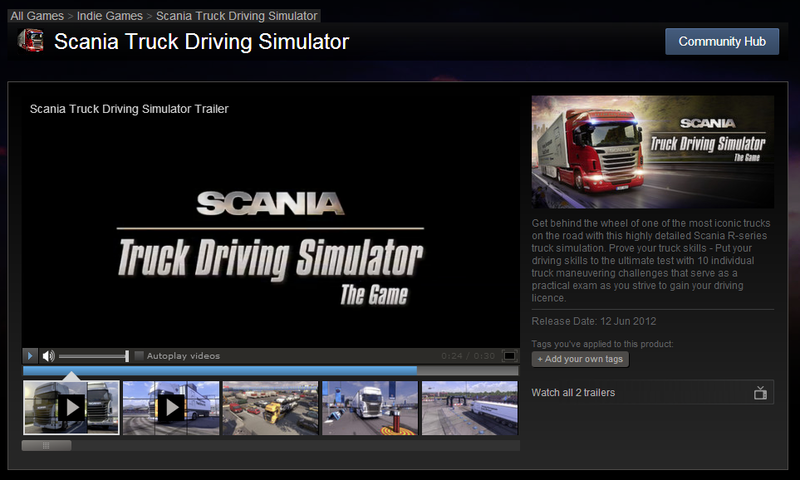 Will there be a Linux version of the Scania Truck Driving Simulator? I played STDS again a couple of weeks ago and realised how for ETS2 has come. would grand if the improvements made to the driving experience since ETS2s launch could be incorporated into STDS too. I feel like this should have been an addition to ETS 2. It is something I have wanted in ETS 2 for a while now as there are very few places which are actually challenging. The lack of licence tests in ETS 2 just seems strange to me. You should have to pass these tests to drive fragile cargo and hazardous materials. While I'm talking about it, I feel like the physics could also use a little work. There is no feeling of loss of traction when cornering or braking hard which just doesn't feel right when you are commanding a 20 ton lump of metal. Some tire smoke and screeching would add a lot to the detail of the game. I also feel the rain effects should worsen at speed as it is fine to drive without wipers as the rain barely makes a difference. Finally, I feel like the acceleration is really slow when compared to the AI drivers. It is simply impossible to match their acceleration. Some sort of tuning mechanic would be a really cool addition where you could alter brake pressure, gear timings, suspension etc. These are just a few of my ideas to make a great game even better. Can't wait to see what else you have in the works for ETS 2! A driving sim on a touch screen device. Struggling to think of something worse. Please! Try to put all the 18WOS collection on Steam so we can buy it! SCS, before I buy it, please tell me - does it fully and correctly support the Logitech G27 wheel as ETS 2 does? I'm asking as I saw some issues mentioned on the Steam forums and in the description it says "Partial controller support" (whatever that means). Any news on Bus Driver2/ECS? Just for information: like as on ETS2, DVD retails copy and digital "Non-Steam" versions of the game can be actived on Steam normally. Just go to "games\Activate a Product on Steam", agree the terms, type the legit (obviously...) CD-key and done! Download to your library and have fun! Thank you so much SCS!! Please, update my scania, make me able to fly it with my mouse/throttle just like ETS can do. If you truly like someone and he likes you then age should not be a factor, this much is true. However, in some cases, when the generation gap is too big, you may learn that you really do not have anything in common. On the other hand some relationships which include couples who are 20+ years different in age work out just fine. It is going to depend on the chemistry and how well the two of you relate to each other. The best way to attract an older man is to be attractive in body, mind and spirit and don’t sweat the small stuff.